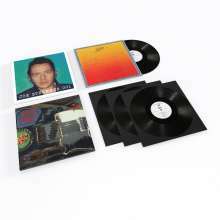 3	LPs, 1	Single 12"
Der Artikel Joe Strummer: Joe Strummer 001 (180g) (Vinyl-Boxset) wurde in den Warenkorb gelegt. 4LP - 3 x 180g heavyweight black vinyl of Joe Strummer 001 albums – each in their own single sleeve and combined in to one wide-spined outer sleeve each featuring restored and remastered audio by Grammy award winning Peter J Moore. Additional 180g heavyweight 12" single of previously unreleased U. S North. All 4 vinyl packaged together into outer slipcase, sealed on one side.